The grounds have been restored to their former beauty with many well-kept trees, bushes and flowers of just about every variety and hue. A lovely pool with adjoining bathhouse, extensively decorated with Malibu tile, several sparkling fountains utilizing Malibu tile, and flagstone pathways winding through this beautiful landscape are additional highlighted. 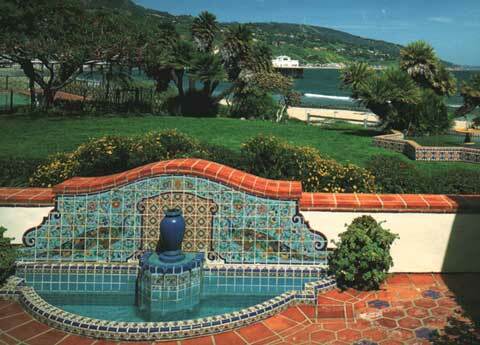 Malibu Potteries, though only in existence for six years, was distributed tile world-wide. Frederick Rindge had always wanted Malibu to reflect the Mediterranean architecture and flavor absorbed from his European travels. The abundance of good quality buff and red clays and the plentiful water supply, coupled with a strong demand for decorative ceramic tile contributed to the establishment of Malibu Potteries by Mrs. Rindge in 1926. The talented artists and craftsmen of Malibu Potteries produced an amazing variety of shapes, sizes, colors, and designs. Products in their catalog included wall tiles, floor tiles, fountains, vents, step treads, tables, fireplaces, murals and decorative panels, furniture, swimming pool tile, and many other items. The Malibu Lagoon Museum adjoins the Adamson House and contains a collection of artifacts, rare photographs and documents depicting the colorful history of Malibu. The museum tour takes the visitor from the early Chumash Indian era through the Spanish California culture. A museum tour takes you from the early Chumash Indian era thru the Spanish California cultures, the genteel and romantic ranching days of the fabulous Rindge and Adamson families, and the incredible growth years to today. It is a great opportunity to relive the genteel and romantic ranching days of the famed Rindge and Adamson families. You will learn about one of the most interesting dramas in the history of California land laws; the Malibu Railroad; the 50-room Castle on the Hill; the 17 year legal battle over a Malibu Highway; the Malibu Movie Colony; and the Malibu Dam. Admission to the museum is free. 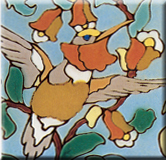 Colored reprints of Malibu Tile, hand-painted pastel views of the Adamson house, and many other unique gifts are available in the Visitor Center.